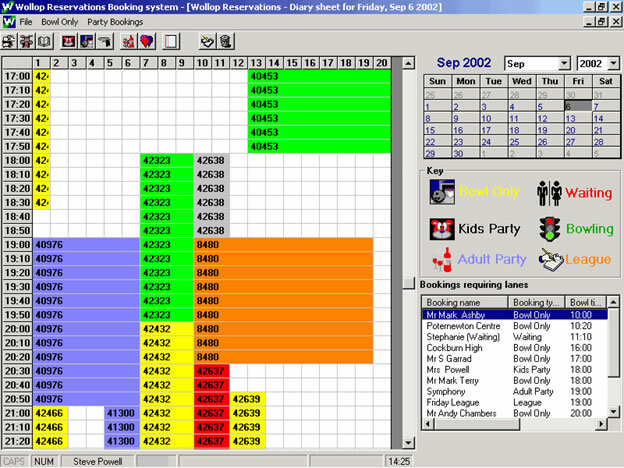 Fully integrated network booking software allowing reservations to be taken in multiple locations. 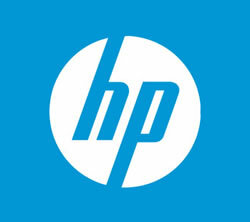 Predefined booking criteria eliminates mistakes resulting in satisfied customers. 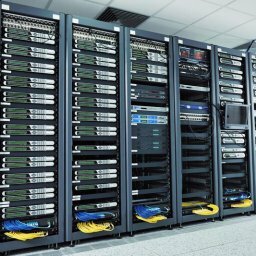 Full reporting facilities means increased staff productivity and increased profits. 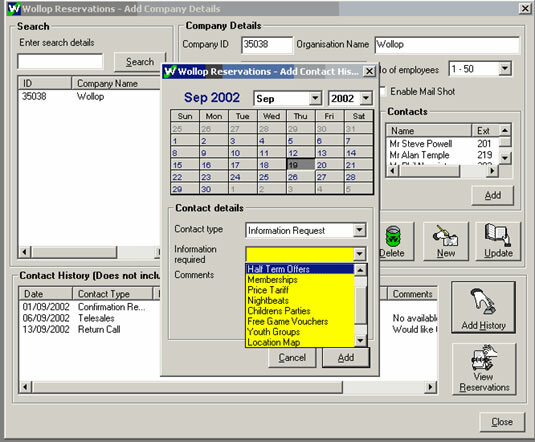 Contact Management will ensure your staff deal with customer requests efficiently and promptly. Full data capture gives you the ability to market your center like never before. The Main Lane plan will provide an immense amount of information even at a glance. The calendar will instantly take you to any day in the future or past, if you wished to review the previous days trade. 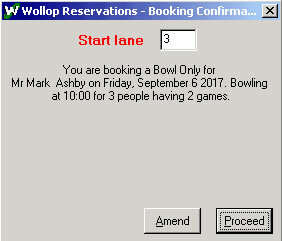 The easily distinguishable colors will ensure your staff know where customers are going to be bowling. 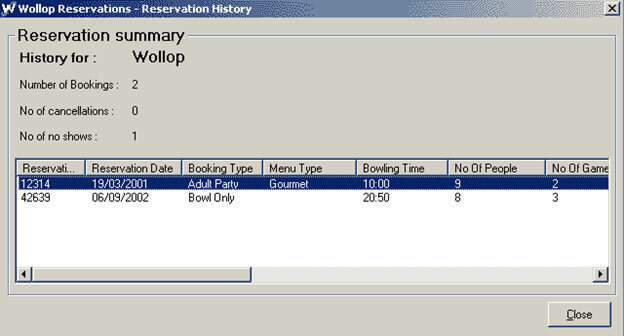 A list of all bookings can be sorted by any of the column headings, and a right click on a booking name will highlight where the booking is on your lane plan. Making a reservation could be simpler. If the customer has booked before their details can be brought back by searching either their surname, telephone number, post code or a combination. New customers are easily added with the use of QAS® Postal Address Search. 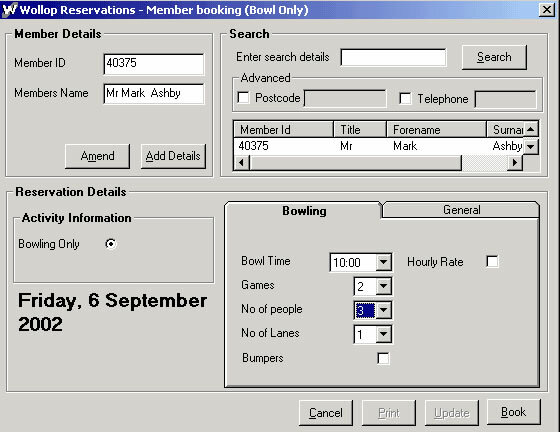 Enter the correct bowling details and click book. 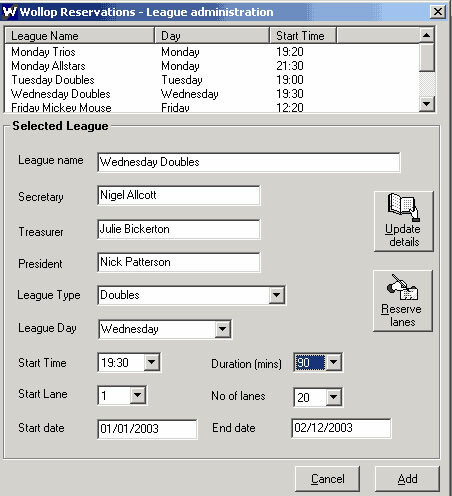 If no lanes / times are available the screen will prompt a message box and ask to to re-enter the data. Simply enter the postcode in any format, click search and a full Royal Mail post address is inserted into the address fields. 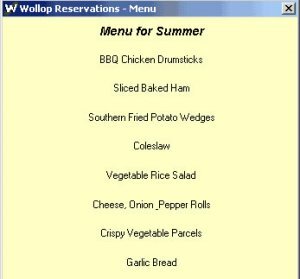 When taking a company party booking you no longer have to try and fit all your information in 1 or 2 boxes on a A3 sheet. 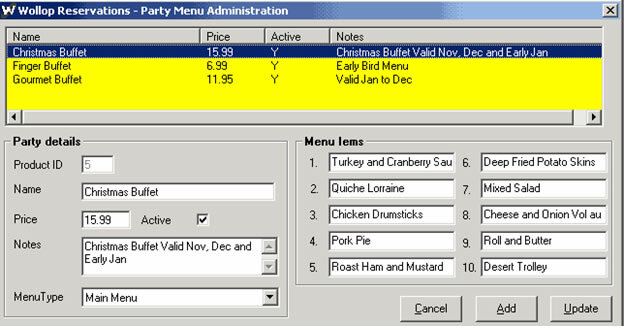 All information, eating times, menu type, total numbers and sub notes is taken and stored. 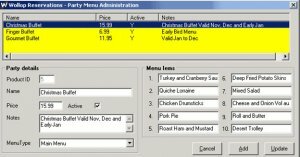 If the customers poses the question about the menu choice, a simple click on the view menu button will pop up the menu details. Every time a reservation is made, a splash screen will show a summary of the details for your staff members to read back to the customer. This will ensure the correct details are taken, especially important on busy evenings when you may have cosmic or disco bowling. 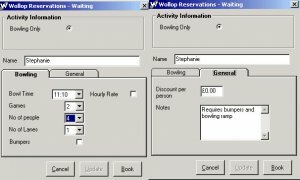 When reserving lanes for the “Walk-in” or “Waiting” customers, you only have to take a limited amount of information, the bowling details and any special notes. 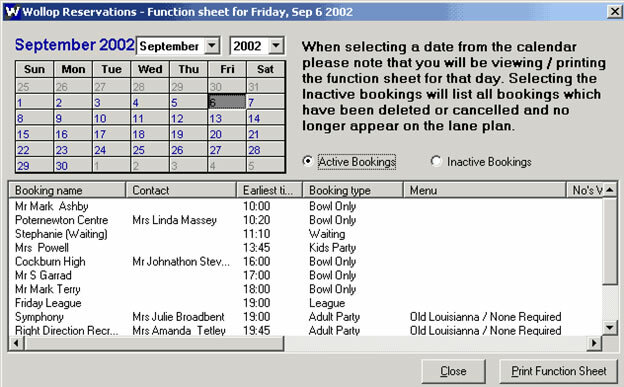 Waiting customers appear on the lane plan with a different colour, making the bookings easily identifiable to your reception staff. 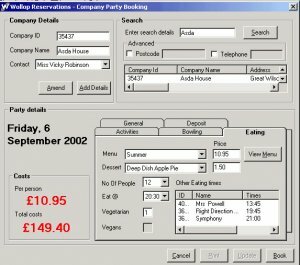 All your customers details are kept, together with all the reservations they have made, including the times when they cancelled or didn’t turn up. 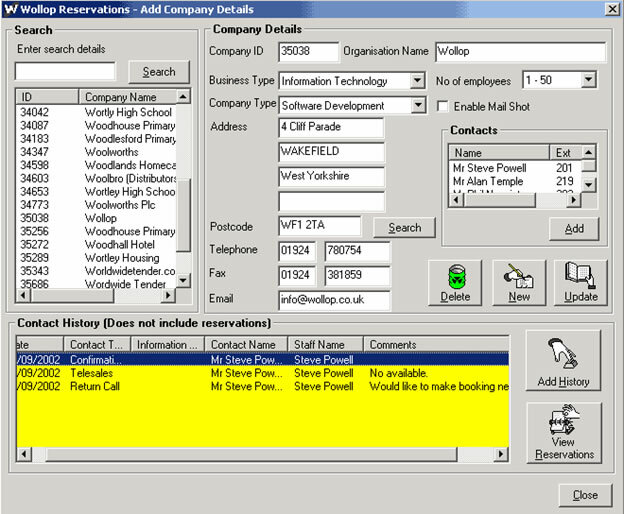 With company administration you can store information relating to address, phone, email and 1 or more contacts. 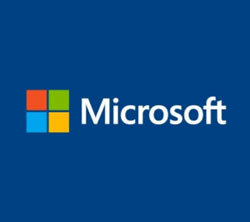 The company is also classified into Business Type and Company type, thus when you want to carry out specific direct mailing you can specify your target recipients. 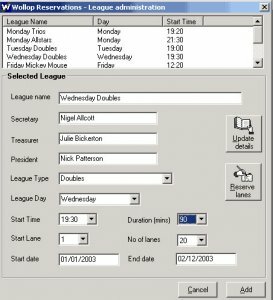 No longer do you need to spend hours marking out the league lanes in your diary. 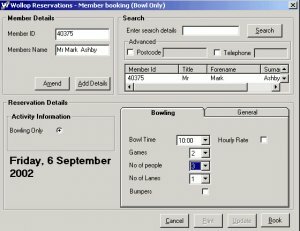 Simply input the league details, together with the start and end dates (there is no limit to the weeks you want to book out) and select reserve lanes – no more leagues having to have no bowls because the lanes weren’t reserved. 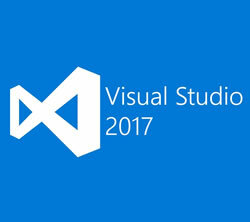 Daily function sheets can be sorted by any of the column headings, although the earliest time is probably the most useful. This can be printed and distributed to all your departments to ensure the smooth running of the center. With your company or adult parties all the relevant menu information including the price is stored and this is can be easily accessed when making a party booking. It is vital for your business that your reservations are honored, so it is sometimes preferential to ask for a deposit in advance. 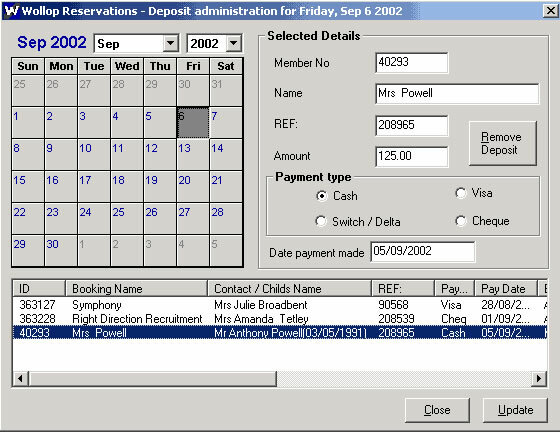 The built-in deposit utility allows you to record deposit payment information, including amount, payment type, payment date and your own reference. 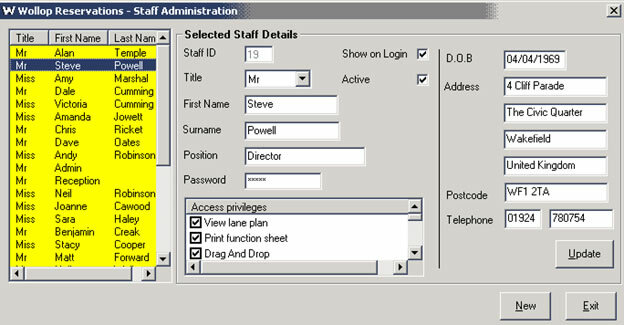 All staff log onto the system with encrypted passwords. 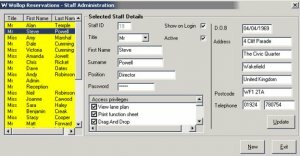 As a system administrator you will be able to set the access privileges for each and every staff member. 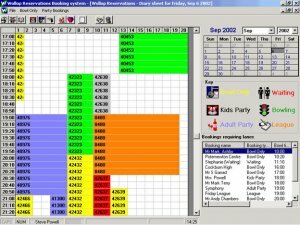 This is very useful when you have “new starts” who may be unfamiliar with such reservations as children’s parties, so they will not be able to process such a task and have to forward the reservation to a more experienced staff member, thus ensuring the customer has the best possible service. In today’s economic climate it is essential that if you are reserving lanes for a customer, they turn up and utilize your services. Nearly all centres will operate some kind of deposit policy, and with Wollop Tenpin Reservations it makes the control of these deposits easily managed. Full payment information taken, including date, payment type, amount and your reference. 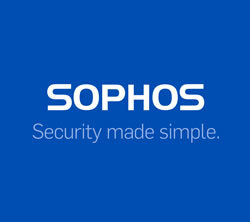 Deposits can be associated with any booking type. Party packages auto default to check for deposits. Unpaid deposit report makes life easier for your administration staff. As the system is configured to your own centers details, number of lanes, time intervals etc., you will no longer have mistakes made in your bookings. If you are a 20 lane center then it is impossible to over book. The booking confirmation dialogue, will let your staff read back all the relevant details to the customer therefore ensuring that the booking is taken correctly. As all information about a company or person together with their full reservation history is stored in the database, this data can be transformed in to sales analysis, income projections for advanced bookings or in-depth data reports about your business. 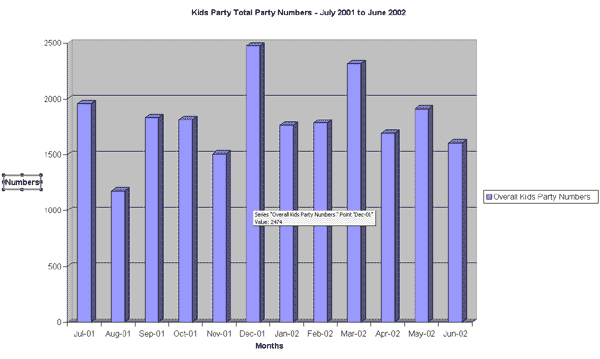 Graphs detailing your business trends and comparisons will make your budgeting easier. The management report utility will generate hundreds of your direct marketing letters instantly. Prompted confirmation letter printing for all types of bookings. 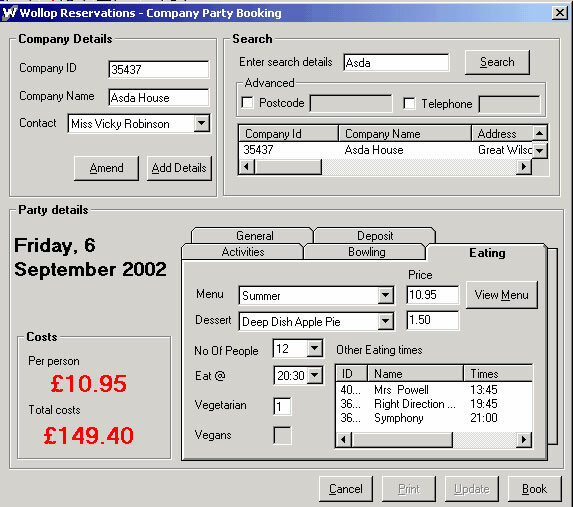 For example, when a customer has booked a children’s party a confirmation letter can be automatically printed with all the customer’s details, including the party details as well as the information you wish to pass on such as menu details or a deposit request. 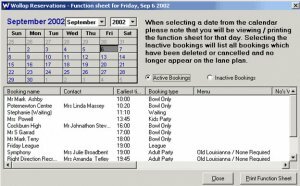 Function sheets can be printed for the days business and issued to all departments, thus all staff members have all the relevant information they need to keep your customers happy. All bookings that require a deposit can be printed automatically to for you staff members to ensure that payments are made promptly and the reservations are honoured. 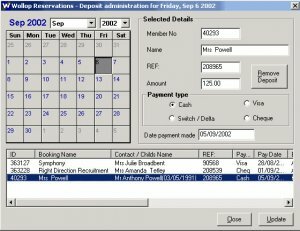 When calculating business trends, there is no longer a need to sit for hours with the diary and a calculator, simply choose the date span and booking type and charts and totals are automatically calculated.